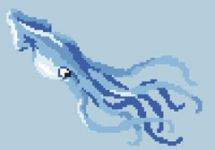 Counted cross stitch pattern of an octopus.Ocean creatures that are most famous for having eight arms. 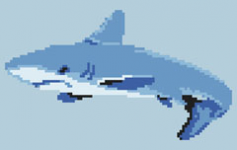 Marine themed pattern of a shark in the ocean.The pattern contains only full stitches. 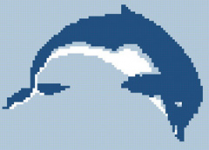 Cross stitch pattern of a cute whale, the largest mammal in the sea. Wonderful pattern of a horse on a dark background. Simple cross stitch of a leaping dolphin stitched with just two colors of floss. 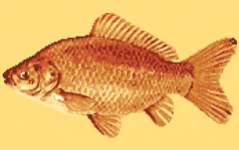 Wonderful pattern of a red bass fish. May the holes in your net be no larger than the fish in it! Wonderful cross stitch pattern of a tiger, the largest member of the cat family. 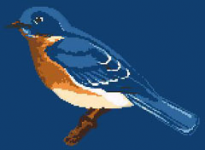 Cross stitch pattern of a bluebird, considered the quintessential "helpful" garden bird. 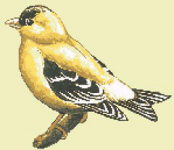 Free cross stitch pattern of a goldfinch bird. The chart contains only full stitches.